Recently acquired Marrakech (in fact, just twelve days ago) as I just couldn't resist the actual felt carpets and the wooden Assam piece with his cute little red fez hat. Frustratingly, it came missing one of the yellow carpets. So after an email by me, I got a quick message back guaranteeing a little yellow carpet in the mail and complimenting me on this here bloggy thingy. Lovely. 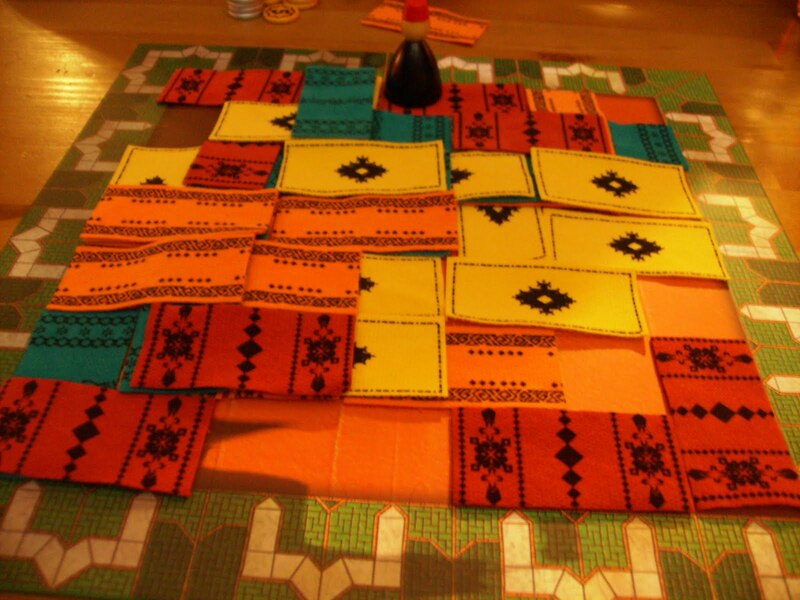 RELATED: Marrakech is just a delightful little game - very tactile, quick, and a little bit nasty. A review is on its way after another play or two. Days of Wonder, in their usual, brilliant way of drumming up interest in upcoming titles, have started a Whodunit Contest for the their upcoming release Mystery Express. All the rules and details are here. The first thing one notices upon purchase is the weight of the box. What's inside it is impressive and fills the thick bookshelf size box to the brim. 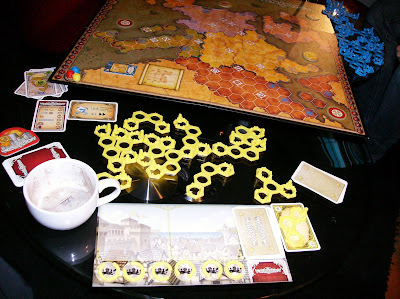 Each player gets 12 large plastic fief tiles, 6 rings, a player board, and a complete set of cards to go with the enormous board. I must say I am quite happy with the contents, given the price of the game. 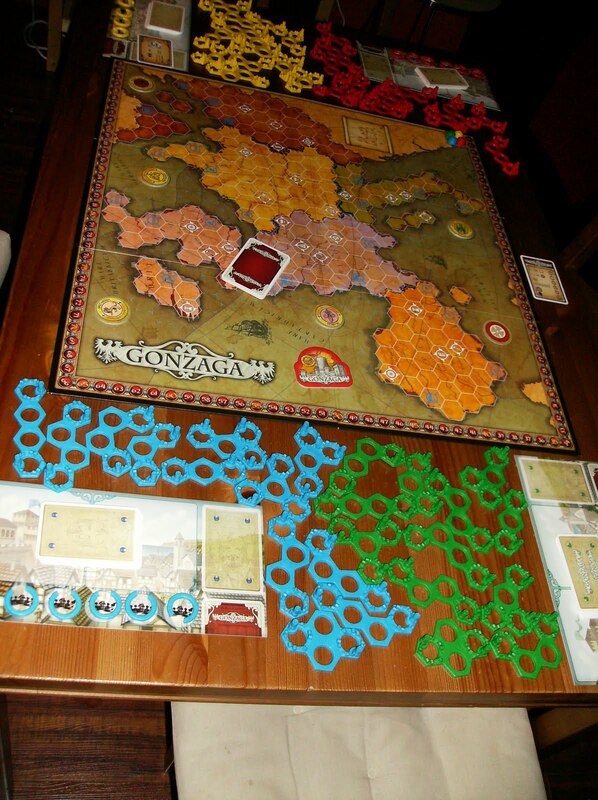 The board itself is nicely drawn and totally functional and really looks great once it fills up with fief tiles. The production is top-notch and we actually had trouble fitting the entire game on our table with the pieces spread out. 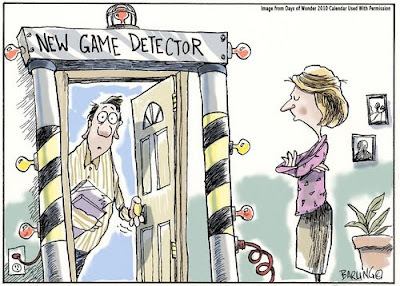 Normally, this would be a great thing but actually may be a slight drawback given the brief nature of the game. Verdict: Great bits and amazing value but almost overdone. One cannot fault this company for bad rulebooks. This one is a beauty. Clear, tons of pictures and examples, and really easy to read. The rules themselves aren't very complicated but the details are as good as a Days of Wonder game. I keep mentioning DOW partly because of the original TTR comparison, but also because the component quality and rules clarity is just so high. Verdict: Excellent. Relatively simple game, very well explained. So the rules themselves are laid out well and fairly quick to explain but the game itself was a bit opaque for the first couple games. 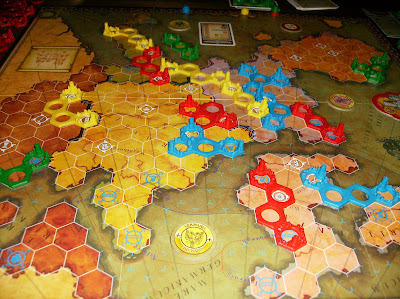 The goal, as usual, is to get the most points and like most modern games, there are a few different ways to do that. 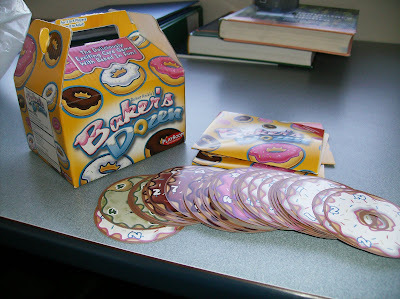 The game takes place over a number of rounds (between 6 and 12) and each round you get to play exactly one or two pieces on the board. 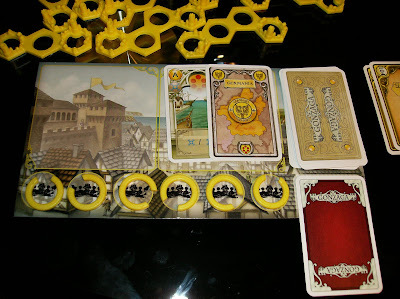 At the beginning of each round, a card flip determines which fief tile you get to use that round. Once everyone's found their tile, each player determines secretly which region they'd like to play in and whether they want to try and cover cities, harbours, or both. 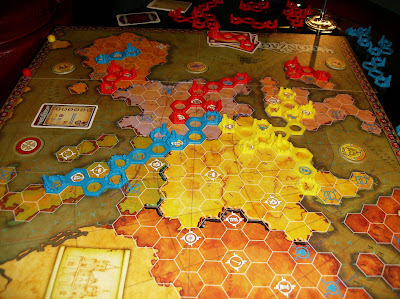 After the reveal, turn order is determined and the players either place their tiles legally on the board, getting 1 or 3 points immediately for each city and harbour covered, or if a certain action is chosen, they can place ring pieces on the board instead. The advantage of the rings is that can cover an occupied space and will fit anywhere. If neither of these options work a player can donate their tile to the church for a quick, albeit disappointing, 3 points. Now, minus a few other small but important rules I won't mention here, that's it for gameplay. What makes things much more interesting and tense are the bonuses. Each player starts with a bonus card indicating 6 cities in the 6 different regions. The more you cover during the game, the higher your endgame bonus. We have found in the games thus far that if you ignore these cities, you will lose. Period. So you gotta cover 'em. Or as many as you can, especially if someone else has to cover the same ones. As well, there is a bonus for covering sets of matching harbour spaces as well as a big 15 point bonus to the player with the most connected tiles. Ah! Now it's really starting to sound like Ticket to Ride. And this whole process ends up being quite a lot of fun, I must say. 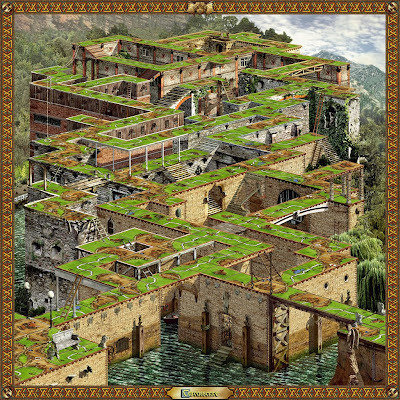 Almost every tile you get will not fit exactly the way you want it to so the game at times feels like a little bit of a spatial puzzle. This combined with the guessing and second-guessing that you must do against your opponents actually makes for quite an original play experience. Quite different than anything else I've tried. I must say, though, that the game feels kinda clunky and it's hard to describe exactly why. Maybe it's the constant picking up and putting down of action cards or the search each round for the tile that matches the card. Or possibly it's the huge setup of cards, board, and tiles that corresponds to such a quick game (45 minutes with experienced players). I'm not sure, but this is where the game feels a bit over-produced and slightly weighted down. Verdict: Fun and puzzling and quick despite the extensive setup. I will admit that the first couple games, I felt a bit foggy on what to do. One definitely has to make an effort to cover the cities given on their secret goal card. If not, you lose. The winner of each game we've played has covered the most cities every time. As well, the 10 points from the harbour triples really adds up and is something that also needs to be factored in. And as I mentioned, the whole puzzling aspect of fitting the pieces together really adds a level of depth that distinguishes this game from most others. 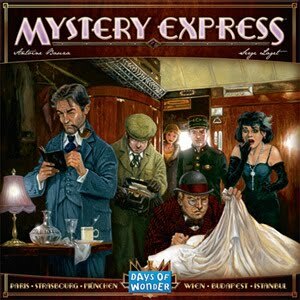 Having said all that, I don't think this game has the depth of strategy that a family game like Ticket to Ride has (and yes, after my 50th game of TTR, I'm still discovering things about it). I already know that despite the other ways to gather points, if you don't cover the cities on your goal card, you will lose. This does limit things a bit but as I said before, the game is so short that it doesn't seem to matter too much. What it does have going for it, is that you only really make on average 9 or 10 real decisions so they HAVE to be the right ones. Verdict: There's definite strategies to play here and tension galore, but not as much long-term depth. Feels more tactical. I will conclude by saying the first game was weird, the second was interesting, and the last couple were tense and delicious. It also helped that the last three games were 4-player. This game has adjustments for two and three but I just don't see the great tension and board conflict for those numbers. Four is ideal. Managed to play Royal Casino, my latest bargain basement find, at games night on Monday night and it was delightful. 30 seconds to explain the rules and 30 minutes to play with 5 people. It was fun, nasty, and quick. After doing a bit of investigating, it turns out this is really a reprint of Sharp Shooters, Games Magazine's 1995 Game of The Year. After that, a player suggested another dice game for which we only needed 6 dice and a scorepad. I was wary, to say the least. What proceeded was ANOTHER delightful lightning-fast push-your-luck dice game. She called it "Dice" but when I searched online, some others called it, "You Blew It". The full rules are here (the second version on the webpage is the one we played - much better with the stealing). 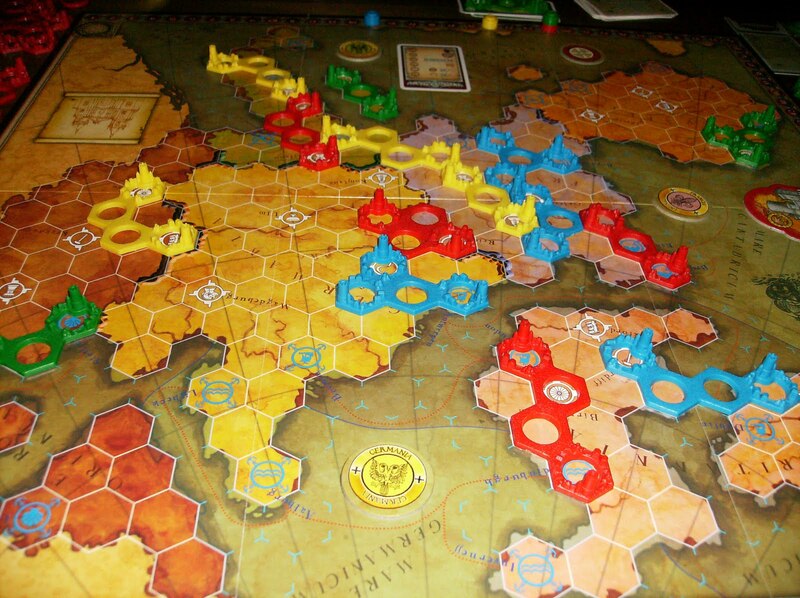 Been conversing with Trent, the head of "The Board Game Family" and just took a look their great blog. Definitely worth checking out if you are interested in great games for families or just games in general. 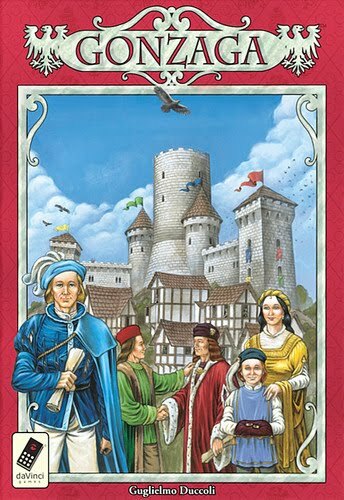 They do great video reviews of family board games (Carcassonne is below). 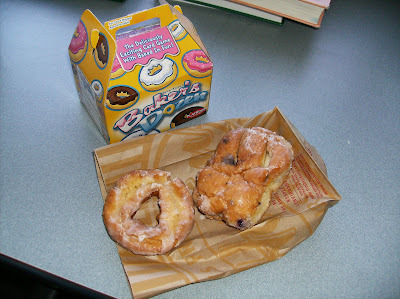 Here's the game with my breakfast this morning: a sour cream glazed and a blueberry fritter. Seriously, this is a bit ridiculous. I blame it on the german importer guy who lives 5 blocks away from me. Every player (including you) reveals the top card of their deck. You decide if the card revealed gets discarded or goes back on top. Then reveal cards until you reveal a non-action card. Put all revealed cards into your hand. When this card is in play as well as a potion, You may lay the Alchemist card on the top of your deck during the cleanup phase. Potion This is new commodity in D:A. It is a treasure which costs 4 and will be required in hand to activate certain action cards. At least that's what the speculation is.